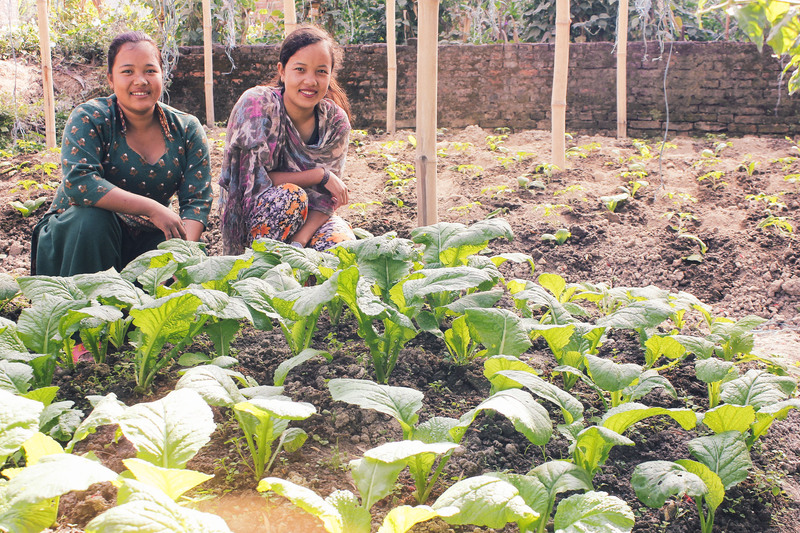 Photo: Women in our rehabilitation program are happy to learn gardening techniques that will help them provide for themselves after graduation. We are happy to report that three women (ages 18-23) recently graduated from our ‘She Has Hope’ trafficking rehabilitation home in Nepal. These woman are planning to start their own tailoring businesses in their home villages. We expect that with their newly acquired skills, they will be very successful in their new ventures. One such example of a success story is that of Chandra who started her tailoring business six months ago in her native village in the Nuwakot district. She is now making 5,000 Nepali Rupees monthly, well above the national average wage of 3,200 Rupees. She gets 10-15 customers per week who make requests for new handmade clothing as well as clothing repair work. Chandra’s success is the fulfillment of our goal to equip girls enrolled at the ‘She Has Hope’ home with everything they need to know to stand on their own, healed and full of hope. The girls currently living in our rehabilitation home are doing well, learning to make necklaces and stretch bracelets designed by one of our volunteers, a jewelry designer, who traveled from Houston, Texas, to visit the girls in July. She expanded the girls’ jewelry-making skills by helping them to source new beads, showed them how to properly close/clamp long necklaces, and taught them to make earrings using a new technique. Learning these new skills, along with literacy, cooking, craft-making, the seamstress trade, and gardening through daily coursework offered by our full-time teachers, we are helping the girls to become independent economically. Learning all of these skills also helps them generate income, and introduces them to more new designs which will help them sell their products. Photo inset: (Top-left): The girls are wearing necklaces they handcrafted, which were designed by a volunteer jewelry designer who visited them this summer. (Top-right): One of our rehabilitation home graduates, who has successfully started her own tailoring business. (Bottom-left): A girl from the home proudly shows off her work. (Bottom-right): Girls at the home work on knitting together, one of the many skills being taught to them prior to graduation. The girls are also learning to knit woolen sweaters and make traditional Nepalese dresses. Many of their creations will be sold online at the ‘She Has Hope’ crafts shop where all the profits go toward the girls’ rehabilitation. The girls also recently prepared the soil at their garden project and planted tomatoes, cauliflower, and spinach. They are looking forward to harvesting these vegetables in January. Upon harvest they are able to enjoy the fruits of their work as they use the organic ingredients in their cooking classes and surprise each other with their culinary creations. It gives them joy to experience their own creativity as they serve one another. In addition, the garden project not only provides the girls with nutritious ingredients for their meals, but it also equips them with the understanding of advanced gardening techniques. They leave the home with knowledge of how to start their own gardens to provide for themselves. As always, we are very thankful for your generous donations and your faithful prayers, helping to improve the lives of our girls and give them a future full of hope.